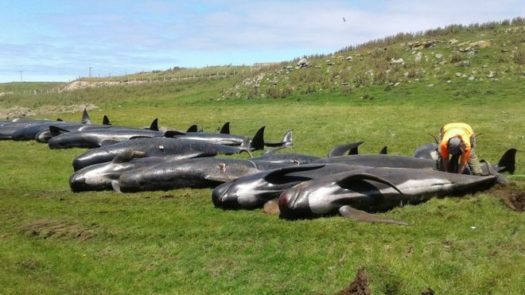 51 pilot whales have died after they were stranded on a beach on the Chatham Islands off New Zealand. The mass stranding means more than 200 whales have died in separate incidents over the past week in the region. New Zealand’s Department of Conservation says between 80 and 90 whales were found to have become stranded in Hanson Bay on Thursday, according to BBC. Several dozen whales managed to get themselves back to the water, but 50 were found dead and one had to be put down. The whales are being buried in the sand just behind the beach. The DOC is taking skin and blubber samples for analysis. Many people are shocked and very worried about these whales and there are many unanswered questions. How are all of these whales washed up on shore? How can they be there long enough to die before anyone notices these whales? We need answers. We need change.